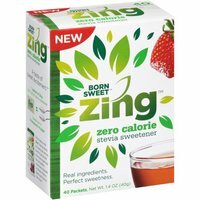 ZING HAS A GREAT TASTE! Thanks, Stevia is a natural product not an artificial sweetener. ty and really like the great coupon too ! I finally found a sweetener that I like. Have tried other sweetener combinations and this the one for me. ty but why did I not get points for this? Tasted delicious in my iced tea! Used sample same day I rec'd and love it! Tasted like powdered aspirin. I don't "get" stevia! This did not taste very sweet to me. This product is very sweet. TY looking forward to trying this! Page wouldn't load for me. But thanks anyway. Thanks, but not a product I would use. Great. You can have mine! Thanks. I've tried this before.